Question: I work in a school and have made a number of MS Word resources of my own for my classes and my department. I would like to upload these to the school's website but I wanted to have them as Readonly and uncopyable Word files where the content was uncopyable. I am currently running Windows 7, Microsoft Office 2010. Is what I want achievable with the software I currently have or should I forget the idea? Answer: There are two methods to make readonly and uncopyable word files. Create the document in Word or whatever. 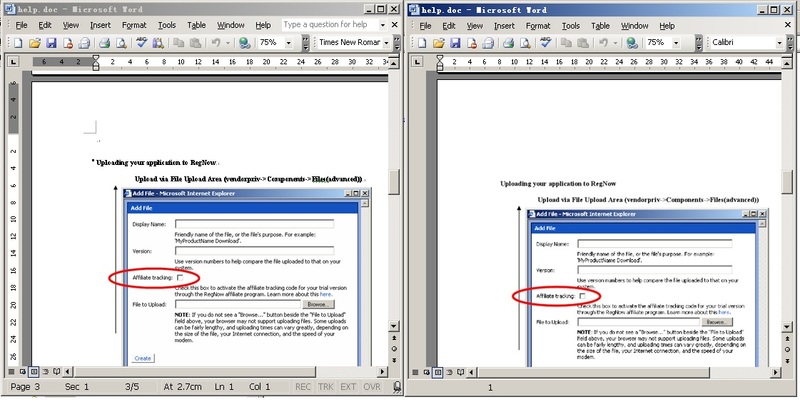 Use Print Screen to copy an image of the document. Paste the screenshots into a new Word document. This would give you a MS Word file of images instead of a MS Word file of copyable text, this method is suitable for making a small number of word files of images, if you want to make a lot of readonly uncopyable picture MS Word files, you had better to use below method. <2> use CZ Document converter, it can batch make readonly and uncopyable word files quickly. Furthermore, this software not only allow you to do this operation. It can also allow you convert html, rtf, text, Lotus 1-2-3, WordPerfect and Works for windows etc file format that that you can open in Microsoft Word to Postscript Files (PDF, PS, EPS, PXL etc), Picture/Image Files (PNG, JPEG, TIFF, PNM, BMP etc), Read-only Picture/Image MS Word Doc Files(*.doc), HTML, RTF, TXT (ANSI and Unicode), DOC, XLS, MCW, WRI, WPD, WK4, WPS, SAM, RFT, WSD and more! Since this software is so useful, how about telling you right now? You can run CZ Document converter on various windows operating systems and it supports 32 bit or 64 bit Win98, Win2000, WinNT 4.0, WinME, WinXp, Win2003, Win Vista, Win 7, Win 8, Win 2008, Win 2012. You can download it from http://www.convertzone.com/document_converter/demo/czdocvt.exe, and the installation file size is about 10M! After simply double-click the file, and you will be able to successfully install it. After installation, CZ Document converter is shown automatically in the Start menu, and create a set of folders. Double hit the icon of this software, then set "-13=Readonly Picture MS Word Files(*.doc)" as Destination File Format in GUI, Please see below picture. Then drag your document “help.doc” into this program. It will show "Set Destination File Path" dialog, then click "Specified File Path", and input "d:\test\dest files" as destination file path, final click the button “OK”. Please look at below picture. Open the source file “help.doc” and the destination file “help.doc”. You can find that we had already made readonly and uncopyable word files. Please look at the screenshot in the below. So by this software CZ Document converter, you can covert office files include making readonly and uncopyable word files. Hope you can use the CZ Document converter v5.0 in your daily work. Thank you for your reading. There are too many functions of this software to be listed, for example convert word to image, add watermark etc, please check more on homepage. Please note when you use this software to make readonly and uncopyable word files, there will be MS Word application installed or else the conversion will fail. When you use this software, if you encounter any problem, please contact us as soon as possible.